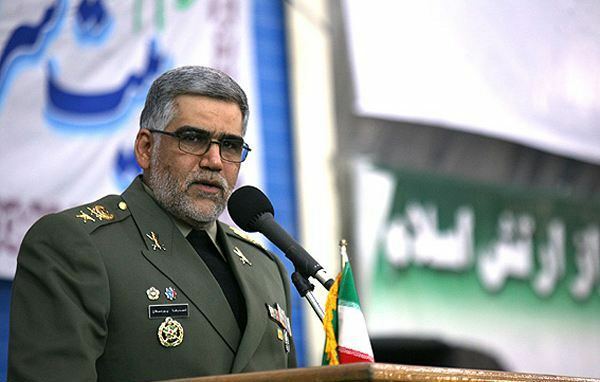 Commander of the Ground Force of the Iranian Army (Artesh), Gen. Ahmad Reza Pourdastan, today said the country’s armed forces are “fully prepared” to counter any insurgency threats to the Iranian borders. The Armed Forces carefully monitor all moves along the borders and appropriate strategies are devised to counter all possible threats, Pourdastan added. There were no explanations of why the commander of the Artesh ground forces, responsible to defend territories along the borders, should make such statement at this time and if the Artesh has gone into heightened state of preparedness. In June 2014, the Artesh ground forces deployed five brigades, including armor and artillery units, into the Iraqi territory to stop the advance of the Islamic State (ISIL) forces from approaching western borders of Iran. Gen. Pourdastan recalled that episode during a parliamentary testimony in March. Now he probably could have seen indications to be “fully” prepared. Full-scale intervention in Iraq? I hope so. Unlike Syria, Iraq borders Iran, like Yemen borders Saudi Arabia. General Pourdastan is a role model, which other armies of the world can only dream about. More likely they are concerned about ISIL's possible plans to infiltrate western Iranian provinces, as they once tried in June 2014. So you should rest in peace with so many military geniuses defending you. I don't understand why ISIL would be so foolish though. It may be related to the recent activities of pjak (pkk branch in Iran). They have been creating unrest on the western borders recently. As Turkey is heavily pounding them, it doesn't seem wise for them to open another front in the east. What happened to Hoveyzeh, Talayeh, Aghareb and Fallagh projects. What products have you made based on the Armour Jell. What is the real firing rate of the Moharram Gatlin gun? How many rounds can it fire before being jammed? Do you know SN Scar 17 combat rifle? It appears to be a good candidate to replace G3 and AK 47 as a next generation rifle in the army. It is 7.62×51 mm or ( 5.56×45mm), relatively light, accurate with good punching power, minimum recoil, good fire rate and easy to maintain. It worth looking at. What is the status of the Ghaem project? Why was that so many cruise and ballistic similes missed the target in your recent naval drill? Have you find the cause and fix the problem? Can you develop full auto pilot/Mission control system for your version of RQ-170 and other drones? What is the status of the Besat submarine and Persian Gulf destroyer? What is the status of Bavar 373? How successful is your OTH / BTH radars in discovering stealth aircrafts such as F22? Can you effectively engage with them in case of any confrontation? How many saegheh fighter has been manufactured since 2007? What is the status in the production of the national fighter jet engine? Are you using the F-16 engine given by Venezuela for reverse engineering? What is the status of the the fabrication/installation of fighters digital electro avionic systems / MFDs to facilitate smart ammo usage by the aircrafts? How much progress have we made in manufacturing of an air born phase array radars for our fighters? What is the status of the flight control computers / hardware? What is the status of manufacturing national helicopters Homa and Saba? Nader- Pourdastan also has to make these commments to "reassure" his countrymen that Iran is secure. Even a married man of 20 years still has to assure his wife he loves her right? lol. He is just reassuring Iranians that Iran is still fully secure despite instability all around Iran. seems normal to me. First equipping motor bike / light mobile units to Javelin like fire and forget missiles. This will help our troops in asymmetric warfare substantially. Second developing a stealth supersonic cruise missile which makes interception by anti missile system difficult. Why not? Their masters want to engage Iran in a dirty mud hole and ISIS is their best tool achieving it. All hot air like the rest of their clan.I like to know in which military academy did this "general" Pourdastan receive his officer training in? @10:10 Anon so they fire their bike and walk back! That is smart! May be rocket up their asses to fire themselves next! @Anon 3:33 A- is it you? forgot to paragraph again! if you are at it why not translate it to greek so it is harder to read and we translate back to English? What is your point? What is wrong with that. It is mobility plus fire power and is a best fit for asymmetric warfare. If Houthis could do that, they could have a big advantage. Iran has Sadid missiles, we also have optic guidance technology. By modifying optic system to infra red and thermal guidance and doing some modification on the missiles and installing programmed chip on board of the missile, we van do it. it is not easy thought but our engineers have the knowledge and means to do that.